I haven't sewn in awhile due to my kitty passing away and another being really sick. Today I made a skirt I've been meaning to make months ago when I saw this pin. I found this coral fabric at my newly discovered fabric store for $2.50 a yard. Never could I get something like this at Joann for this cheap, even on sale. I've learned never to go to Joann again for fabric or ... anything. Last time I bought fabric there, they cut it 3" too short. 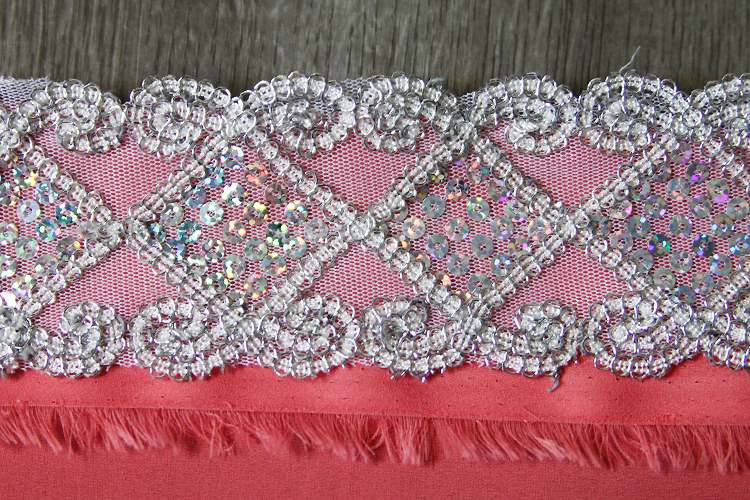 I wanted to add a little bling to the waistband so when I found this lace (also at my new fabric store) for $1.50 a yard, I nearly passed out and bought 3 yards. If I had more money I would have gotten 100. Just kidding. My total cost for this project was $14! 1. Figure out your measurements. 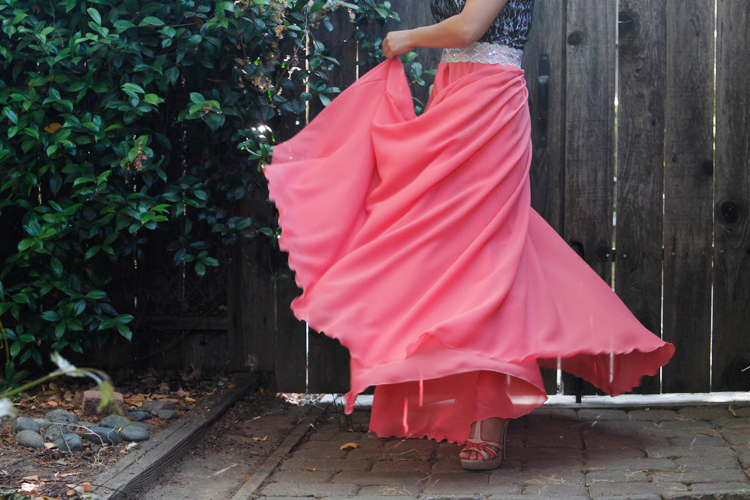 Unless you use a bed sheet, your fabric will not be large enough to cut a whole circle skirt from. You'll need to cut 2 half circles. Here are 2 methods to cutting. 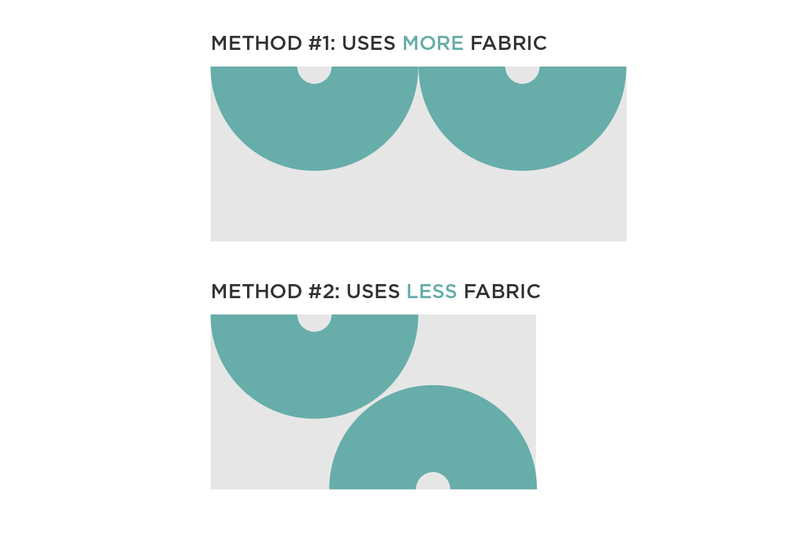 I find I can save fabric and money if I cut using Method #2 because fabric is pretty expensive, I'm cheap and I need money for my cat's vet bills. 2. Figure out your half circles. 3. Cut a lining fabric the same way as the outside fabric, but shorter. The length depends on you. I made it short so I could save fabric. 4. Hem the bottoms of both the main fabric and the lining. You can do a standard hem for the bottom. I used a rolled hem on my serger, which turned out to be even more amazing than sliced bread. This was so quick and easy—I left it exposed as it was beautiful like that and it won't fray. 5. 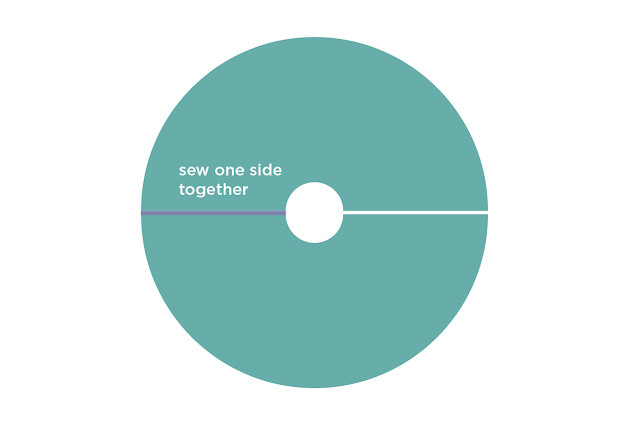 Sew the two half circles together on one side. Do the same for the lining. 6. 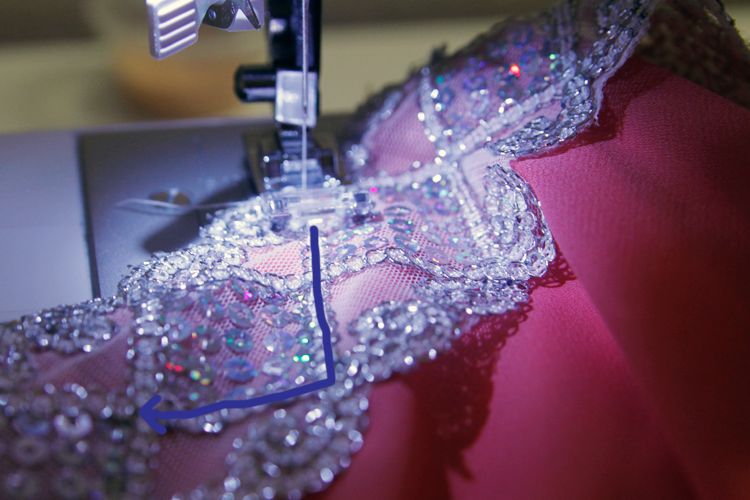 Sew the lining and the main fabric together at the waist. Remember that both of them should have one side still open. This is where the zipper will go. 7. Attach the lace waistband. The lace should be at least your waist measurement (or wherever you want the skirt to sit) plus 1-2 inches. When I sew on the lace, I go in a zig zag pattern, following the lace's pattern. This will make the waistband sturdier and won't be visible. 8. Now, attach your zipper on the open side. I used an invisible zipper so it won't show that much. This was a pink zipper since I couldn't find a matching zipper for my fabric. 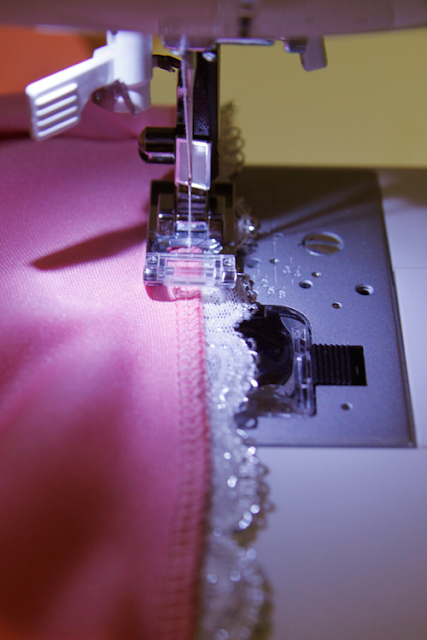 Make sure your fold the lace under like the photo so it won't fray. 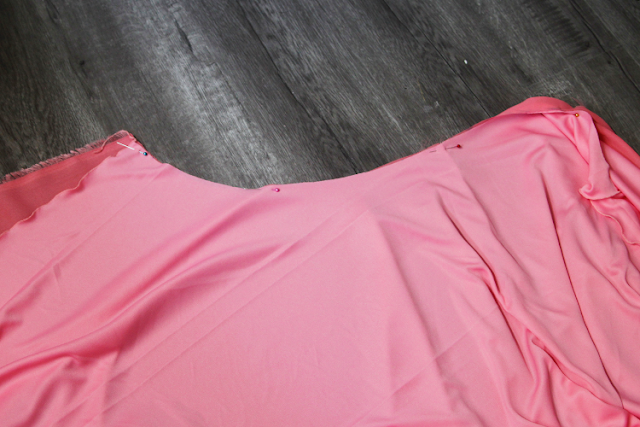 After attaching the zipper, the last thing to do is sew the rest of the side of the skirt together. Where is this glorious fabric store you speak of?? Hi Chelsea! The store is called Minh Phat Fabric. You might not live near there but I would recommend checking out family-owned fabric stores in your area, especially owned by ethnic families. They tend to sell at a lower price than big stores like Joann. I found a store owned by an Indian family that has very cheap fabric even when it's not on sale. Hope that helps! what kind of fabric is it? I believe it's a crepe georgette. Hi i was wondering if i did my math right before i actually cut the fabric i found .. .My waist is loosely 48 inches and i wanted the skirt to be about 43 inches long. Would the inside circle of the semicircles end up being about 15.3 inches? For some reason just by looking at the fabric it seemed to be too small of a waist "hole" . Did i miss the math somewhere? What other fabrics would work for this skirt? Its super adorable! I'm a beginner sewer and was reading that crepe georgette can be difficult to work with. Thank you! Does it matter how long the zip is? You will need something that drapes like georgette, such as satin, silk or chiffon. However, chiffon is too thin and satin is slippery. Silk is a bit pricy. You can even try stretch knit, but it will have a slightly different look, although not too much if you use a thin knit. I wouldn't recommend cotton because it's too stiff and won't have that flowy feel. I think stretch knit will be the easiest as it won't fray and slip. Hi Prathima. I can't seem to reply to your comment so hope you check out the blog to see my comment. If your waist is 48", the diameter of the inside half circle should be 15.3". That makes the circumference of the inside half circle approximately 24", half of your waist. 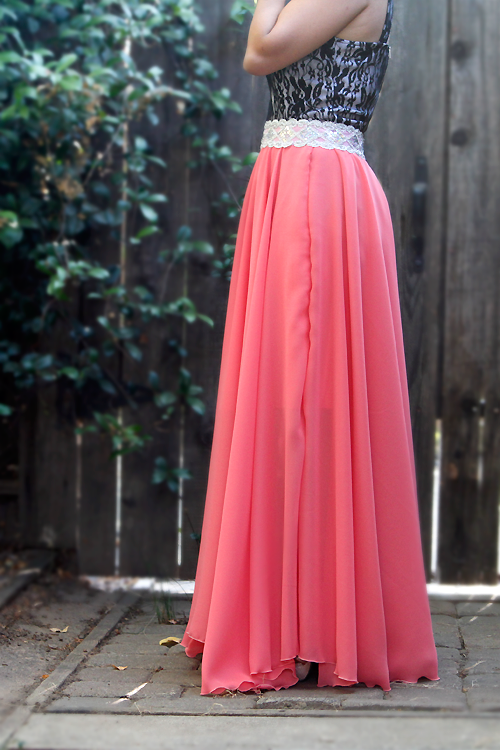 Two pieces of the half circles put together will make a whole circle, thus making your whole waist of 48". Here's an example with my measurements. I have a 26" waist. 26 divided by 6.28 is 4.14. Then take 4.14 times 2 and my diameter of my half circle is 8.28". If you want to test it out, draw your inside half circle on your fabric before cutting it. Then use a string to follow to curve of the half circle. Measure how long it takes for the string to go from one end to another. It will be approx. half your waist. What type of fabric did you use for the liner? Hi, did you pleat the skirt while sewing? How many pleats should be there so that it drapes like the picture? Thanks a lot! Hi Samia - there are actually no pleats. When you wear the skirt, it will automatically look like that. what state or city is this fabric store located at? because yes, Joann's is way to expensive!! Where is the fold of your fabric, or did you not fold it? Also, what width of fabric did you purchase? 45 inch? 60 inch? Different inch? I was just curious how you managed to get such a long skirt out of three yards? I just can't seem to be able to get two pieces out of it? It depends on the width of your fabric not just the length you buy, for example some fabricis might come in 150cm (59 inch) wide or might only be 1mt (100cm / 39.37 inch) wide usually not that small a width that I've ever found. If you had the 1mt/39 inch wide material but wanted a longer skirt you would have to but more material and make the skirt in 1/4 circles instead of 1/2 circles. instead of laying the peaces ^^ you would have to lay them <<<< using more material. if you look at the diagram that she has put for miguring out the amount of fabric she lays the 2 pieces in method 2 if you were to print the pic ount and fold the pic down the middle and fold one side back a bit you would see that the bottom of the circles overlap she uses about 1/4 less material by doing it this way reducing the off cuts at the bottom like you would have in method 1. Hi! I was curious as to what type of fabric you used for the lining? Hi! I am very short and the fabric width was really long, at least 54" wide. The length you need will vary based on where you get your fabric and how wide it is and on your height too. I love this post. This is so helpful. It explains everything. I wish I had a sewing machine so I could stitch a skirt. 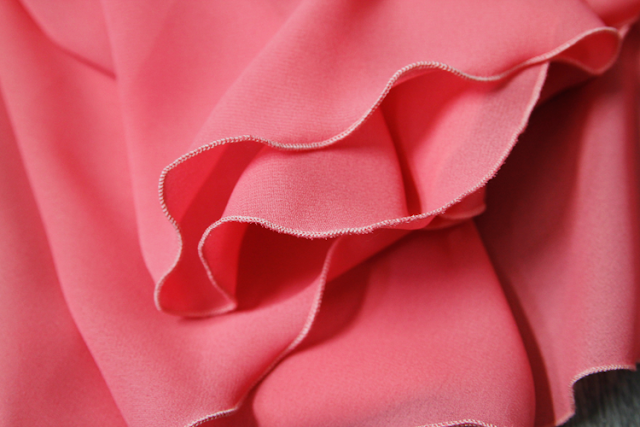 I do have chiffon fabric, in almost the same shade. And also, it's really nice to see you replying to everyone so patiently about their numerous queries. Bless you for that. If I want to use elastic rather than a zipper, would I need to pleat the fabric? Just made a tiny version for my 5 year old. She is in LOVE! Thanks so much for the great tutorial! 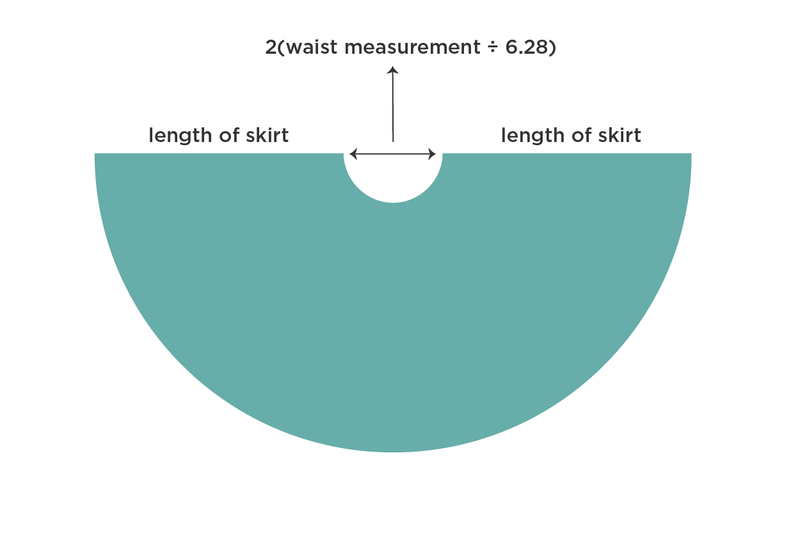 I want my skirt to be long like yours and I estimated I would need a length from hip to foot to be about 35" and my waist radius half is about 14.3". Do I start the length at the radius line or the edge of the fabric. I'm still unsure as to how to make a skirt for myself. I have made a few for my 2 yr old. Hers comes to her knee and I just don't like skirts to come above the floor. Can you help me figure out the amount of yards I would need if the fabric is about 60" wide. Hi Kayla! Here's how I did your calculations. First I used step 2 to calculate the length of the fabric needed for half of the skirt. If your radius is 14.3", then the diameter is 2x that: 28.6". Take 28.6" plus 35" for your length on one side plus another 35". That's a total of 98.6" for half of the length of cloth needed for the skirt. Double that and that's the length you need for your skirt, which is 197.2". Convert that to yards to be approximately 5.47 yards. That's the amount you need if you use Method 1 for cutting your fabric in step 1. Make sure to add a few extra inches for seam allowance. Hope that helps! Could I add a high double slit to this skirt and two layers one silk chiffon and poly chiffon? 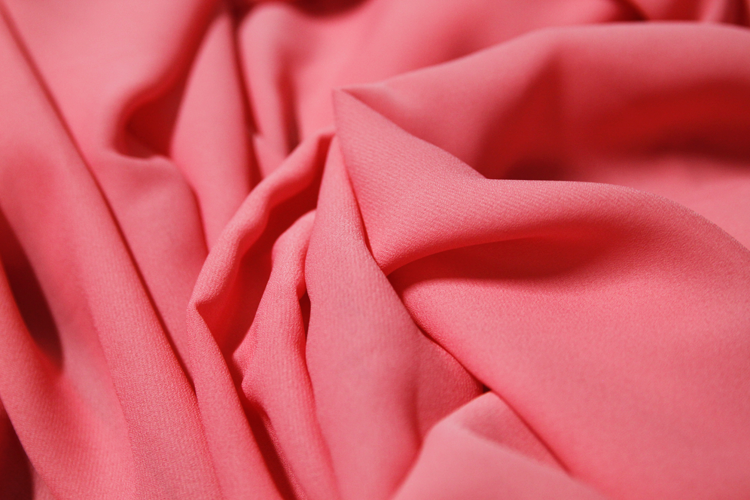 Silk chiffon would go on top of poly chiffon. 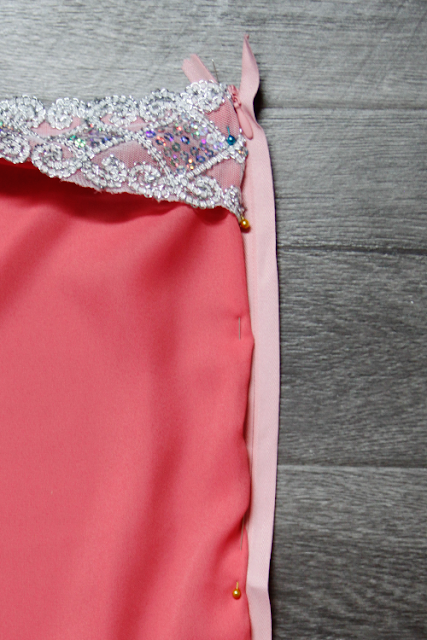 Can I sew the silk chiffon over the poly chiffon? I made mine grey and it turned out ASOLUTLEY BEAUTIFUL!!! Thank you SO MUCH!! !